South Africa’s building industry is rife with problems, so whether you are building a house or a swimming pool, it is essential to employ professionals with the experience needed to do it the right way. The mere fact that an individual or business advertises his or her services is not enough. You need to be sure that the person or company you employ to build your swimming pool is not only competent and financially sound, but totally ethical and trustworthy as well. Strand resident, Lize Perdigao learnt the hard way. Empty and cracked, the rock pool went from being a dream to a disaster. 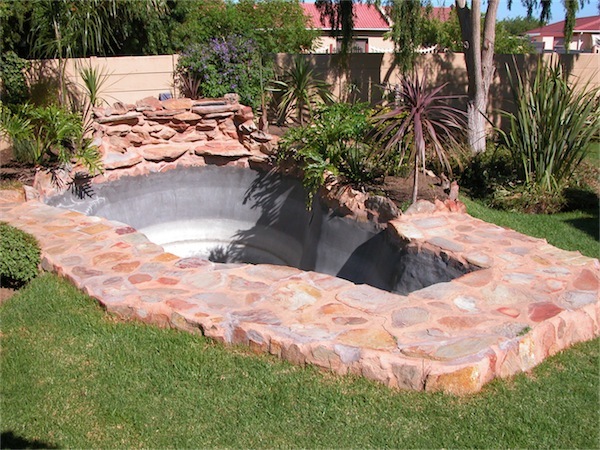 Like many South Africans, Lize Perdigao had dreamed of the day when she could build a swimming pool in her garden. She worked hard and eventually saved up enough money to have a small plunge pool built. Lize had never heard of the National Spa and Pool Institute (NSPI) and based her choice of pool contractor on an advertisement she spotted in a local publication. Ironically, being aware that people do sometimes get ripped off by less than honest builders, she insisted on seeing examples of the man’s jobs. He convinced her with an impressive photographic portfolio of photographs of enchanting rock pools he claimed to have built. Lize signed the man’s contract and started to part with her hard-earned cash. It didn’t take long for things to start going wrong. In fact the pool began to leak just months after it had been completed. Having warned Lize that there would be “settlement cracks”, she wasn’t unduly worried at first. He had promised he would sort them out after three months once the structure had settled. Lize became suspicious when the contractor ignored her telephone calls. But eventually, after eight months, he sent his foreman to patch the cracks. By this stage the cracks were getting wider and wider and rocks were coming loose from the rockery. This was in 2007, and it was costing her R250 a month to keep the pool topped up with water. There is an old saying that it’s better to be sued than to sue, and unfortunately for Lize this was the case with her rapidly deteriorating rock pool. It looked like a cut and dried case in her favour. But conmen think ahead, and even having obtained a Court judgement, when her lawyer had the man’s car and bike attached, they discovered that both were registered in a girlfriend’s name. Unable to afford to keep filling the pool or to have it repaired, the pool of Lize’s dreams stood empty for more than a year. The cracks continued to widen as the marbelite and handpacked concrete shrunk more and more. It would have to be rebuilt. If Lize had used an NSPI member to build her pool in the first place, and the pool had cracked, the Institute would have got involved and helped with conflict resolution if necessary. But because NSPI members undertake to build according to NSPI and/or SABS specifications, it is very unlikely that this kind of scenario would ever happen. That is why the NSPI offer peace of mind. Tip 1: Use an NSPI registered contractor to build your swimming pool. Tip 2: Ask for contact details of a few previous clients and check that they are happy with the workmanship. Tip 3: Visit two or three of the pools that have designs similar to the one you plan to opt for. Tip 4: Check any contract carefully before you sign it. Tip 5: In the unlikely event of things going wrong once the pool is complete, contact your pool builder immediately to prevent the situation going from bad to worse. Note: The South African NSPI was modeled on the American NSPI. There was also an NSPI in Australia, but it closed down in December 2012.